Astrodon 3 nm H-a and OIII ultra-narrowband filters mapped to red and green=blue, respectively, and Astrodon Generation 2 RGB E-Series filters. 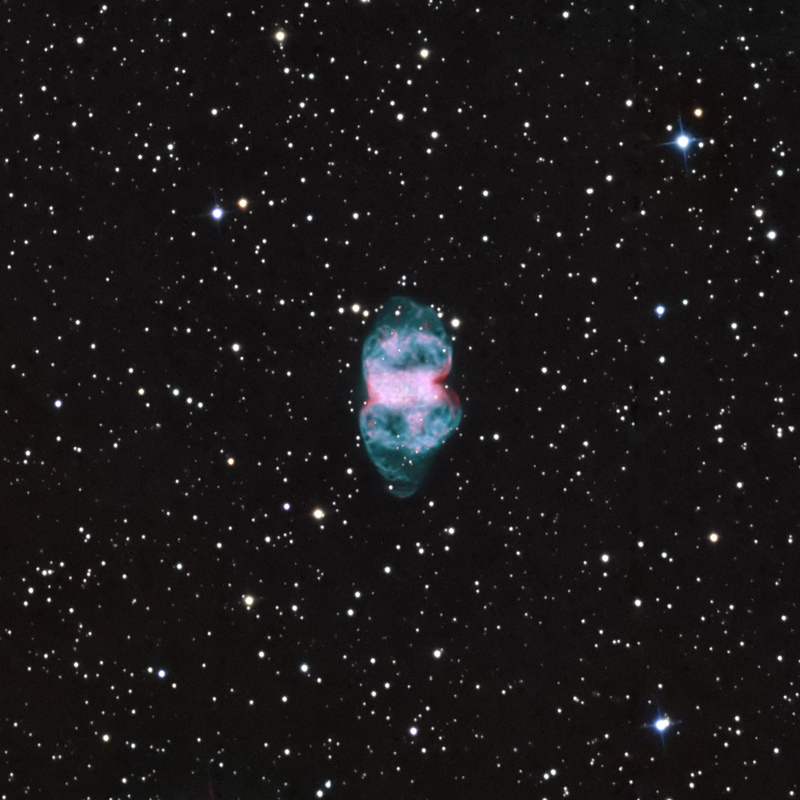 M76, the Little Dumbbell Nebula (NGC650/651) is a familiar planetary nebula in Perseus. It is known for a bright, rectangular core with two opposing "ears" or lobes. It is one of the fainter Messier objects at mag 10.1. It was suspected of being a double nebula and hence given designations of NGC 650 and 651. The bright, somewhat rectangular core, is reminiscent of the Dumbbell Nebula, M27, which is why it is often referred to as the Little Dumbbell. It is also known as the Cork or Butterfly Nebula. It is thought that the bright core is a ring or ellipse viewed nearly edge-on. Gas is expanding perpendicular this ring, forming arcs or lobes ejected as the Red Giant collapsed, evolving to a white dwarf. At mag 16.6, the central star is seen in this image, which radiates a temperature of 60,000k. The distance to M76 is uncertain, but some estimates place it at 8,200 light years. Its apparent dimension is 2.7 x 1.8 arcmin. The image above is a composite, taking advantage of the superb contrast and detail from 3 nm FWHM H-a (656 nm) and OIII (501 nm) filters for the nebula and RGB for the stars. Most images of M76 show the bright core and the two lobes. The 3 nm narrowband filters provide additional detail in the lobes, but most importantly, clearly show rarely seen additional extensions beyond the lobes. These extension also have complex structures. This additional information makes the lobes appear as a bright ring around a larger bulbous structure on both sides of the core. The extensions appear to have different shapes, with the easterly (bottom) one appear to be pointed and the westerly one more round.